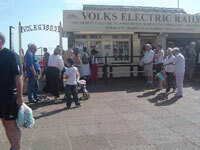 Magnus Volk, the Brighton man who designed and built the Volks Railway, was a 19th century inventor and engineer. The son of a clockmaker, he set up the first telephone line in the city in 1879 and pioneered the early use of electricity. He brought electricity to his own house in Dyke Road and soon had the Royal Pavilion illuminated in the same way. With these projects behind him, on 14 June 1883 Magnus Volk wrote to Brighton’s town clerk seeking permission to lay an electric railway near Madeira Road (now Drive). After some deliberation this permission was granted and on 4 August 1883, at midday, Magnus Volks’ electric railway was formally opened on Brighton sea front by Mayor Cox. This short demonstration line was very different to today's operation, being 2' gauge and only ¼ mile long. The car was powered by a 50v dc supply which was taken from a gas engine and dynamo located in the Royal Humane Society's Arch under the promenade. In 1884 the line was extended to Banjo Groyne and grew in length to 1400 yards. 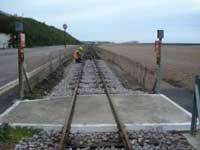 The line was also re-gauged to 2ft 8½in being laid using 20lb/yd rail. The railway’s power supply was changed to a supply voltage of 160 volts dc at up to 40 amps and it was supplied from a more powerful gas engine and dynamo. This was now located in Paston Place Arch, the site of today's office and workshop for the VER. At the front of the upstairs office Volk installed a balcony so he could keep a watchful eye over his railway. This balcony exists to this day! Through 1900 to 1901 Volk proposed an extension to the line to Black Rock. This was granted in February 1901 and was opened by May the same year. The VER line was now 1.25 miles long, the longest it has ever been. Nowadays, the line is only 1 mile and 90 yards. Over the years various changes have taken place, for example in 1930 the western terminus at Aquarium was moved eastwards and in 1936 the Black Rock terminus was relocated nearer the pier, shortening the railway line to its current length. With the outbreak of the Second World War in 1939, the beach was fortified and the line was closed. By 1947 the line was virtually wrecked by neglect and corrosion. 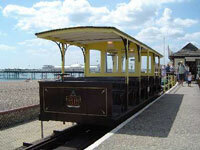 Fortunately, that year the Brighton Corporation took over and they set about restoring the railway. They laid heavier track (50lb/yd), put in new electrical supplies and restored the seven best cars. The line reopened in May 1948. 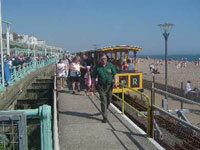 The Brighton Corporation became the council and the railway has operated under local authority control ever since 1948. Today the VER is looked after by three permanent council employees and a summer season team of eight. The VER celebrated its125th year of existence in 2008. The railway runs for each summer season and remains the oldest electric railway in Britain, (as authenticated by the Guinness Book of Records). In 2015 the council won a successful bid from the Heritage Lottery Fund (HLF) for £1.65million. This money is being used to restore carriages from the historic Volk’s Railway as well as providing new and upgraded facilities and activities.